Have you ever thought it would be fun to yodel? To yodel down a mountain while skiing your favorite slopes. Amaze your friends with a talent and they have no idea how you do it. Here is your opportunity for yodeling success. I have been in the yodeling business for twenty-eight years now. Many people over the years have asked if I could teach them how to do it. Due to my schedule it was always hard to teach others on a regular basis. I therefore decided to create an instructional cd that would help others learn the ancient art of yodeling. This cd will help you find the natural break in your voice. The yodeling break is sometimes illusive but can be learned with a little effort. Some people naturally know how to yodel and yet others work years on it and never figure it out. Wherever you are in the learning process I think this cd will help you get a lot better. Along with teaching you how to break your voice, I've included exercises in both the male and female range. Don't worry if you are female and find that the male exercises are better suited for your vocal range or visa versa. Gals might have low alto voices and you guys might be high tenors. So choose the range that seems best for you. At the end you will hear me singing examples of yodeling songs that you can emulate. Yodeling for me is like singing jazz. Everyone does it different and everyone sounds different doing it. I therefore suggest that after you have achieved a bit of success that you strike out on your own to develop your own yodeling styling's. Know that nothing in yodeling is the wrong way to do it, except when you don't yodel correctly by not singing with improper technique. The old adage that yodeling will cause nodes on your vocal cords is both a correct and a false statement. If you don't sing with diaphragm support like an opera singer you could rub small nodes your vocal chords. If you sing and yodel correctly and are totally relaxed while doing it you should never have a problem. This brings us to singing correctly. Many people I hear yodeling have learned to sing somewhat incorrectly and therefore risk the possibility of injuring permanently their delicate vocal chords. I have helped some to find vocal coaches to train them to sing correctly first. This is not a bad idea for any one. Over the years I have found a few great vocal training courses that will not only help you to sing properly but increase your ability to yodel like a pro. You can find information about these voice lessons by clicking on The Good Stuff link here and on the left hand bottom of my site. 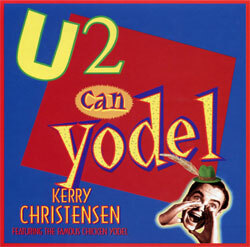 Many grandparents tell me they buy the U 2 Can Yodel instructional cd for their grandchildren and put it in their Christmas stockings as a stocking stuffer. Kids learn fast and catch on to yodeling quick. Others get it for their grand kids to aggravate their children when their grand-kids take to yodeling and want to do it all day long. I hear these stories all the time.